Sora tells the story of its namesake: the lone enhanced human, Sora, and her struggle to protect a fading world. 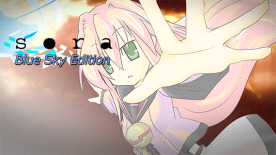 Enjoy breathtakingly fast-paced combat in the Suguri universe, with improved game system and graphics along with original trance music by DEKU. The beautiful blue sky is getting painted darker each passing moment. War. People killing each other. No one even knows who started it anymore. forgetting what they are fighting for. During the war, a girl was born. She was born with a power for fighting. and they sent her to the battlefield with no thought for her feelings at all. The last war on the worn-out planet. Whether it is won or lost, there would be nothing left. Sora did not know the meaning of the fight.